We all know that I have an unnatural desire fondness for sweets. So when I was given the opportunity to try Fiber One, I was genuinely curious since I've never tried their products. But I was also a little nervous. I am a self proclaimed snack snob - especially when it comes to lower calorie type treats. To me, most snacks of this nature have 'that taste'. You know the one I'm talking about. They just have a taste where it doesn't taste like others snacks do. I have always been very particular, and I usually wind up not enjoying them. So, I was curious to try Fiber One, but I wasn't every optimistic that I would really like them. I was given 3 boxes of Fiber One products to try. Cookies & Creme Protein bars, Crunchy Chocolate Chip, and Mint Fudge Brownie. 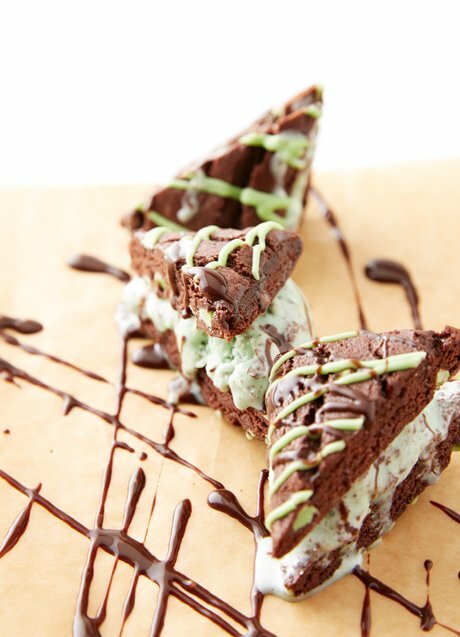 the Mint Fudge Brownie - at first glance, it looked yummy. The texture felt like a 'normal' brownie. And the taste? I loved it. I honestly couldn't tell the difference between the Fiber One Mint Fudge brownie and a regular homemade brownie. I loved the mint chocolate chips inside. And I'm assuming it was the fiber, but it kept me full longer. And I wasn't craving sweets in a couple of hours like I do with other types of sweet snacks. And coming in at 90 calories and 5 grams of fiber, it was a nice afternoon snack to curb my sweet tooth. I haven't tried this recipe yet, but check out this Mint Chocolate Chip Ice Cream Sandwich from Dessertify. In fact, Dessertify has a lot of recipes that I would like to try. I also enjoyed the Cookies & Creme Protein bar, but of the three products it was the least of my favorite. But I did enjoy it. And I would choose it as a snack. It had a little more calories than others with 140 calories and 5 grams of fiber. The crunchy chocolate chip cookie was also delicious. I even gave Hubby one, and he also thought it tasted good. I loved the crunch. I loved the texture. I loved the taste. It also was only 110 calories and contained 5 grams of fiber. He didn't try the Mint Fudge Brownie because I didn't want to share ha. Yeah, I'm keeping those for myself! My overall thoughts? I loved them! In fact, they've worked great to curb my sweet tooth, but they are lower in calories and provide a little fiber (which I don't get enough of). In fact, I loved them so much that I contacted the company and asked if I could do a giveaway. I honestly probably would have never tried these products. But now that I have, I'm a new fan of Fiber One. And I will be enjoying them in my future. And I wanted to give one of you the chance to try these products also. Simply enter the giveaway tool below for a chance to win from Fiber One. I've tried a few different Fiber One bars, but not these. I think the Mint Chocolate flavor would taste really good. I also love that these snack bars are healthy and are only 90 calories (with the one I want to try)!